A [blogger] is someone who can make a riddle out of an answer. 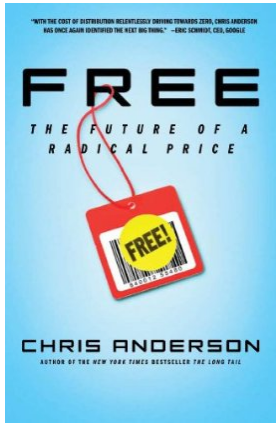 So the new book from Chris Anderson (a.k.a Dr Long Tail) entitled Free: The Future of a Radical Price is out in a number of FREE formats- FREE Sricbd eBook and FREE audio file downloads, plus Google Books, and maybe the comic book version is next. Or manga. Or the Numa Numa dance version. All the Big Boys are bantering abut it, be it Seth or Malcolm and the rest of the internet is in debate (or not, who can say). I’m not here to weigh in, at last not until I have read/listened to it. No matter which side of the fence you land, it ought to be a good thing to have people sussing out if this is a viable business model (for some businesses) or snake oil. Nope, I am adding one more bit of free- while you can download the MP3s of the audio book for FREE — I hate putting MP3s of ebooks in my itunes as it lands in my music shuffle. So I used AudioBookBuilder to convert it to audiobook format, a more elegant way to plow through the 6 hours of audio. And while you can get the AudioBook version from Audible.com for FREE- it requires logins, etc. Mine is totally FREE of that grab your copy at http://bit.ly/audiobook-free. It is FREE Free free of login hassles. Hey Alan, Great post here. I really respect both Seth and Malcolm and I’ve seen a lot of growth by following long tail methodologies. You seem to be writing some interesting stuff here, so I’m going to be sure to pop back in.